They’re here! Shrapnel Games and Developer Camo Workshop announce that the 2018 winSPWW2 and winSPMBT upgrade patches are now available for download! We are bringing a storm of brand new content, revisions, and bug fixes that will leave you militarily motivated. Some enhancements are only available to Enhanced users. These exciting Upgrades (winSPMBT to v.12.0 and winSPWW2 to v.11.0) bring a powerful punch to tactical wargaming on your PC! Every once and a while corrections become necessary. You can always count on Camo Workshop to make corrections efficiently and immediately. The new upgrades for winSPMBT and winSPWW2 are now available. These upgrades replace the upgrades from March 3rd. A description of the changes follow. A couple of obscure but serious database errors were discovered in the Orders of Battle (OOBs) in both games after the latest patches were released. That lead to the discovery that an error that we had thought had been corrected in the coding of the master unit cost calculator a year ago had resurfaced and after tracking that down and checking the recalculated OOB’s it was discovered that perhaps 5% of the units in the games had incorrect costs. The problem is , in the two games combined, five percent of the units is about 2,400 units. Most of those cost errors were minor in the 1-2 point range but some unit classes like attack Helicopters as well as SEAD and COIN aircraft in winSPMBT for example were out by 20 points or so and the ground attack unit class in winSPWW2 was out by a bit less but roughly the same amount. Since this was also a year a new version of the CD was being created we could not knowingly ship the new CD with these errors so the decision was made to correct the CD before it was released and that meant a revised patch needed to be issued. Those who have ordered the physical, safebox, version of these games will be receiving the latest 10.01 and 11.01 versions. Those who ordered the download versions will be receiving new download links to the 10.01 amd 11.01 versions. Those who were just upgrading using the patches can go to the games’ product pages to get the new upgrade patches. Just look for the links under the ‘Downloads’ section. For those who ordered the download version, all the new download links will go out today. The physical safebox versions will start shipping today, but will take through tomorrow to ship all games. All orders will ship in the order received. Those who ordered the safebox games will receive an email when your order ships. Please note if you are currently playing in a secure PBEM game applying the patch WILL cause your game to FAIL. So be smart, wait until completing your game, and then make sure to patch up. The Camo Workshop regrets the errors and the necessity of issuing updated game patches so soon but we strive to release the best possible game we can and sometimes that means things like this will happen from time to time. Get the winSPWW2 10.01 patch here. Get the winSPMBT 11.01 patch here. To get your gaming on please visit us at www.shrapnelgames.com. Check out our catalog of eclectic strategy titles and download demos for all our titles! Twenty tons of metal mayhem thundering from our servers to your computer, crushing all false wargames, Camo Workshop and Shrapnel Games raises once more the crimson flag of glory with the 2017 WinSPWW2 and WinSPMBT upgrade patches! Unleash a storm of new content, revisions, and bug stomping that will leave you breathless. Clear your calendar and plunge into the fire of the most intense tactical wargaming available on your PC! The WinSPWW2 upgrade patch updates the game to version 10.0 while the WinSPMBT version updates that game to version 11.0. These patches are applicable to both the FREE and the Extended CD versions. Owners of the Extended CD version will be excited to hear about some of the new features that are only available for you, so be sure to keep on reading. Before we get into the nitty-gritty of the upgrades it’s time for that annual public service announcement. DO NOT apply the upgrade patches while in the midst of a secure PBEM game as the game will fail. You have been warned. 20 new scenarios, 17 revised scenarios, and 2 revised campaigns. 134 new or revised photos. 73 new or revised vehicle/aircraft icons. 135 new or revised icon and terrain graphic files. 3 revised text files, 71 campaign text files. 7 new or revised sound files. 7 new terrain sets, 10 revised terrain sets. 15 new scenarios, 6 revised scenarios. 10 new or revised map files. 77 new or revised photos. 176 new or revised vehicle/aircraft icons. 138 new or revised icon and terrain graphics files. 6 new or revised text files. 18 new or revised sound files. 7 new terrains, 10 revised terrains. While all of the above is nothing to sneeze at there is also the long list of bug fixes, enhancements, new features, and more. Click here to read the full press release. There you will find links to the respective game forums for full list of changes and links to download the upgrade patches. Key Game Guide files were put in an incorrectly named folder in the orginal patch download and therefore critical info on how to fire NLOS missles was not showing up when players tried to find that info in the Game Guide. As well.- since this had to be rebuilt for the Game Guide info anyway – the T-14 Armata photo that was missing from the orginal patch is now in this ‘b’ version. The missing text file for the “Invasion Sweden 1943″ campaign has been included . Anyone who downloaded and installed the original patch of April 20, 2016 should download and install the new ‘b’ versions. The winSPMBT patch can be found here. The winSPWW2 patch can be found here. 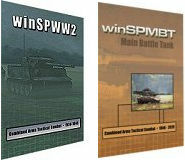 Both winSPWW2 and winSPMBT are available as fully featured FREE downloads or Enhanced Editions (CD or Download) through our e-store. The Enhanced Editions are not different in the core gameplay, but provide a lot of extra bells and whistles for the Steel Panthers connoisseur. Both games work with even the latest version of Windows. Please visit Shrapnel Games to join the winSPWW2 and winSPMBT discussions. While there check out all of our Strategy and Wargames. Lock ‘N Load With All New winSPWW2 and winSPMBT Upgrades! The Top in Tactical Wargames, Bringing You Even More Awesomeness! Lock ‘N Load Sir! Available for immediate download from Shrapnel Games, the version 10.0 winSPMBT and version 9.0 winSPWW2 upgrade patches continue the annual tradition of improving your tactical wargaming experience with winSPMBT and winSPWW2 content, enhancements, and when needed, the elimination of errors. Also added are features just for extended CD version owners only. The 2016 installer will upgrade winSPMBT version 6, 7, 8 and 9.1 to version 10. And the 2016 winSPWW2 installer will upgrade versions 5, 6, 7, and 8.1 to version 9. You can view the entire press release with the complete list of changes here. Visit Shrapnel Games and check out their entire game portfolio. Available Now, 2015 winSPWW2 and winSPMBT Upgrades to the Upgrades! Every once and a while mistakes are made and corrections become necessary. You can always count on Camo Workshop to make corrections efficiently and immediately. The new upgrades for winSPWW2 and winSPMBT are now available. These upgrades replace the upgrades from April 8th. The upgrades can be downloaded directly from the individual product pages. Just look for the links under the ‘Downloads’ section. You can download and get more information on both upgrades at the official Shrapnel Games website. The Greatest Tactical Wargames, Now With Even More Greatness! Can you feel it? The crackle of electricity in the air. That tingle of anticipation running down your spine. It’s that time of year. Once more the season is upon us! The winSPWW2 and winSPMBT upgrades of awesome awesomeness season! Two whirlwinds of content set to shatter your expectations of just how good these two games can get are heading your way. Available for immediate download from Shrapnel Games, the version 8.0 winSPWW2 and version 9.0 winSPMBT upgrade patches continue the annual tradition of improving the winSPWW2 and winSPMBT experience with more content, additional enhancements, and when needed, the elimination of errors. These are consolidation upgrades, allowing those who have not previously upgraded an easier path to bring their games up to date. The upgrades can be downloaded directly from the individual product pages. Just look for the links under the ‘Downloads’ section. Read the official press release for a complete list of changes.